Waitrose British Diced Lamb is produced from lamb reared to high standards of welfare and hygiene. It is the perfect ingredient for kebabs, tagines, casseroles and stir fries. In a large bowl, mix together the lemon juice, 3 tbsp oil, garlic and oregano. Add the lamb, pepper and fennel, cover and set aside in the fridge for at least 30 minutes or overnight. Make the tabbouleh by combining all the ingredients and the remaining oil in a bowl and mix well. Taste and season if necessary. Cover and chill. Preheat the grill to high. Thread the marinated lamb and vegetables equally onto 8 medium-length metal skewers (or bamboo skewers pre-soaked in water). Place under the grill for about 15 minutes or until cooked, basting occasionally with the remaining marinade and turning once. 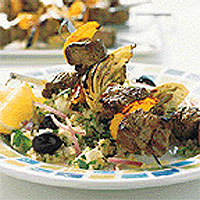 Serve 2 kebabs per person on a base of tabbouleh, garnished with the lemon.